Ainsworth Hot Springs BC Canada is a lake resort community located on the shores of Kootenay Lake - south of the community of Kaslo, BC and northeast of the community of Nelson, BC in the Kootenay region of British Columbia, Canada. The resort community centres around the Ainsworth Hot Springs and the Cody Caves Provincial Park. The four season hot springs are open year round, and feature a mineral hot spring pool, horseshoe cave, and a cold plunge pool. The hot spring resort also provides a restaurant, and the Spirit Water Spa. Activities most enjoyed at Ainsworth Hot Springs and the surrounding areas include caving, hiking, kayaking, fishing, boating and, of course, the hot springs. Ainsworth Hot Springs services important to travelers in and around the community includes accommodations (motel, vacation homes, cottages, resorts). 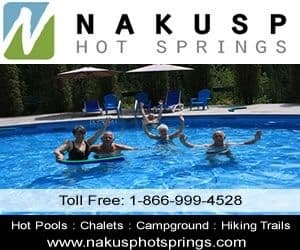 In nearby Kaslo and Nelson BC are various tours, guides, campgrounds, pubs, restaurants, gas stations, gift stores, liquor stores, grocery stores, coffee shops, and banks. eh! Plan to Visit Ainsworth Hot Springs today.